Tuesday 31st January: I’m travelling today with my Dad to the little town of Eisenach in eastern Germany, which is the birthplace of Johann Sebastian Bach. We’re here for a week of pilgrimage, travelling to the towns and cities where Bach lived and worked. It’s a journey I’ve wanted to make with him for a long time, but family circs have prevented it from ever happening before today. So finally picking up our suitcases and heading off for the tube feels like a good moment to be alive. There’s a lovely episode in Dylan Thomas’s play Under Milk Wood, which poetically captures life in a small (and small-minded) Welsh town. The church organist, who rejoices in the name of Organ Morgan, is having a conversation with his wife, who has been droning on a bit. Mrs Organ Morgan: ... but they’re two nice boys, I will say that, Fred Spit and Arthur. Sometimes I like Fred best and sometimes I like Arthur. Who do you like best, Organ? Organ Morgan: Oh, Bach without any doubt. Bach every time for me. Organ Morgan: And then Palestrina. My Dad is not quite Organ Morgan, but he is an excellent church organist with a passion for Bach that eclipses all other composers. He was king of the organ pipes at church when I was a young child, and I was in awe of the powerful and beguiling music he conjured from this Mt Sinai of musical instruments. I heard someone on Desert Island Discs a while ago saying that when they were little, they confused God with JS Bach, and I know the feeling. For several years in my teens and twenties Dad gave organ recitals and accompanied the university choir my Mum sang in. And he remains the gentile organist at a synagogue in Cardiff, where he has been making music, kippah on head, for over 60 years. Bach was frequently on the record turntable when I was growing up in the 1950s, and I often asked my parents when I was 4 or 5 years old to put on ‘Side Six’, the final side in their three-disc recording of The Christmas Oratorio, which maybe has Bach’s most joyful and danceable melodies. It was only in my 40s that I learned that the German lyrics to these closing arias and choruses sing of the triumph of Christ over death and the devil, a theme which has always been important to me. Today’s journey, by rail from St Pancras in London to Eisenach via Brussels and Frankfurt, was simple in theory. Sleek German trains would speed us south from Brussels, wowing us with their cool efficiency. But instead, our ICE train, which travels at up to 300kph, was abruptly cancelled for no good reason and we were left at the mercy of plodding local trains (three of them) and a bus, which eventually disgorged us, mid evening, in Frankfurt Hauptbahnhof. We caught the last train of the night for Eisenach and arrived to biting wind and minus 10 of frost. We’re deep in former East Germany, and on tonight’s evidence, it still knows how to put the cold in Cold War. 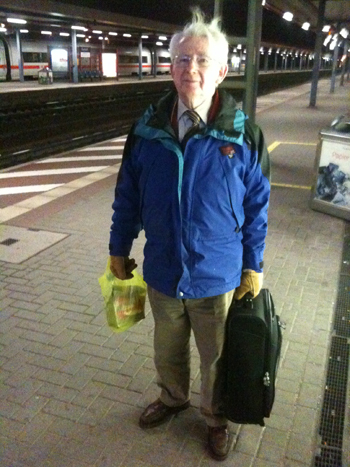 My Dad, 83, despite a day of lugging a case and climbing in and out of carriages, looks happy and content to be here on the platform of Bach’s birthplace. He stands patiently for an iPhone snap (seen above). He’s in Bach’s own country at last. Sorry your journey was so tortuous but great to see this photo of Dad still smiling (well, almost!). Hoping today’s delights will make it all worthwhile! Keep blogging – great start! Organ Morgan eh?